Policy for the Directory: Entries are currently free of charge. We aim to have complete coverage of all folk and traditional performers in Gloucestershire, and the area immediately around. Folklife (Was Folklife West) Quarterly hard copy magazine, edited by Sam Simmonds, with listings, events, and articles. May Hill - everything you ever wanted to know about the folk music of the area. Rod Stradling's excellent Musical Traditions Magazine. The Fiddler's Companion - a great resource, not just for fiddlers! History and music in ABC format of many traditional tunes.The site is currently being updated and will be called the Traditional Tune Archive and will be even easier to use. Mudcat discussion forum - a great place to ask or rant about lyrics, origins of tunes etc. You do not need to be a member to participate. All things folk in Oxford, including details of folk events in Oxfordshire. Somerset and Dorset Folk Listings. 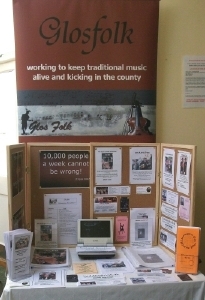 Folk Sales (01242 692243) stock a large selection of books of music, dance, song and traditions and recorded music for dancing.